We've had three great entries already and hope to see many more in the series. 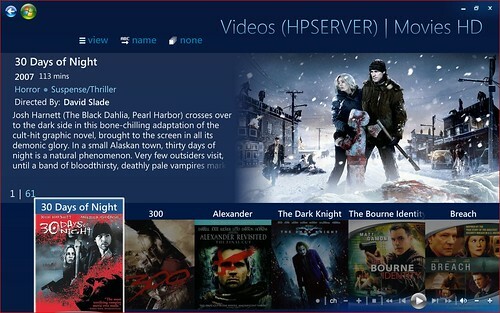 Don't let the first two scare you off - this is for simple sharing of your media gadgets (as simple as a photo and quick review of your HTPC server, favorite media player or whatever) or as elaborate as a full-out write-up of your HTPC setup or Home Theater Build. I'm looking for anything and everything media-gadget related. Deal of the Day: 1TB Western Digital Hard Drive $89 - We've seen the 1 Terabyte drives drop below $90 a few times before, but most of the time you'll see hard drives this size at about $100 or more. I'm looking for the cheapest price point of 1TB to drop down to $70 by the end of this year, but $90 isn't too shabby. 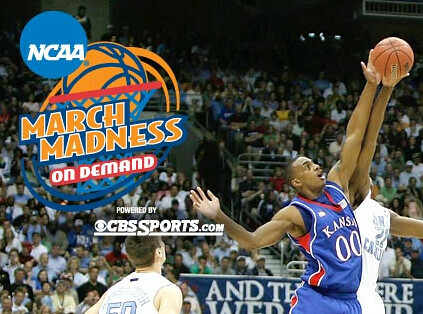 NCAA March Madness Tournament Schedule on CBS - My Missouri Tigers survived the first round with ease. I expect to see a very tough game for them in Sunday's game against Marquette. One of my favorite sporting events. 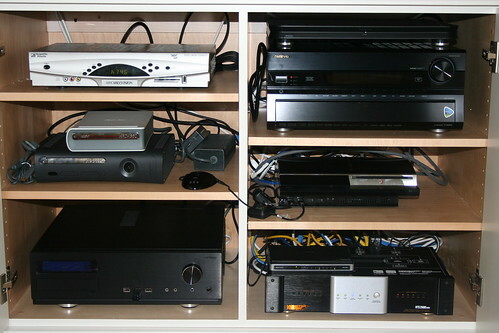 Media Gadget Showcase - Home Theater PC Setup by Damian - Check out this awesome Home Theater setup Damian has created. 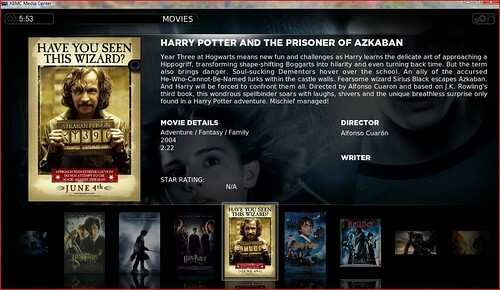 HTPC-powered and the write-up includes lots of information about his HTPC software and hardware. Deal of the Day: Linksys DMA 2200 Media Center Extender with DVD - The Linksys DMA's have been very popular among Windows Media Center users. 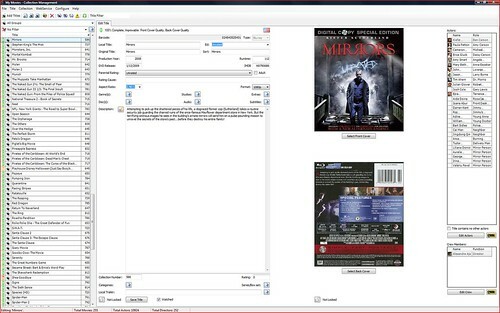 Not my cup of tea with the limited file format support, but a very popular (and inexpensive) option for Media Center users and including a DVD drive is genius. 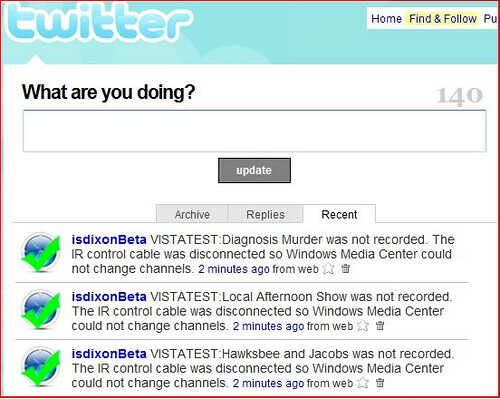 Windows Media Center Health Monitor - An updated version of Windows Media Center Health Monitor. Quick Note: Do Not Buy the iPod Shuffle - I created a bit of a controversy with this title. I'm obviously not an Apple fanboy, but I love the iPod products and do not want to see Apple take it farther down the path they've taken the shuffle. 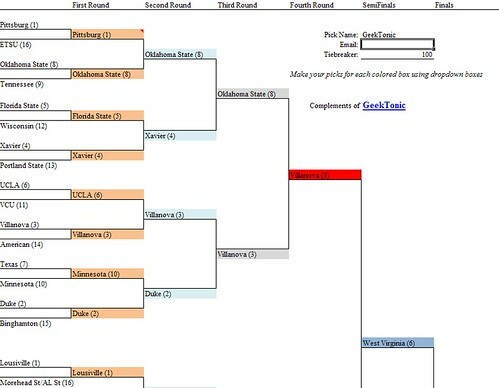 NCAA Basketball Tournament Bracket 2009 Excel Free Download. For the second week in a row I've been a bit sidelined by work demands but I'm hoping to get back on track soon. I still have several good posts planned for the coming week, but that's a wrap for this week. Deal of the Day: 1TB Western Digital Hard Drive $89! Western Digital Caviar Green 1TB 3.5" SATA 3.0Gb/s Hard Drive $89.99 after entering promo code: EMCLPNL29 at checkout. With Free Shipping! For those interested in the NCAA Basketball Tournament starting today, below is a listing of the games airing on CBS. I'm still looking for a good, CBS coverage map to see which games will be shown in which locals, but just know if you have to, you can always get all games from CBS March Madness on Demand or even on your iPhone with the mobile app starting at 12:20pm EST. Our third submission for the GeekTonic Media Gadget Showcase Series is an awesome Home Theater PC Setup. Damian shows us his HTPC setup and talks about the tools he's used to make that HTPC setup awesome. Read on for his great write-up with photos to share. NOTE: This is a guest post by Damian. To read more about how to submit your photos and/or write-ups for the GeekTonic Media Gadget Showcase Series, read this. Basic guidelines for writing and submitting a guest post at GeekTonic can be found here. My wife and I bought our first house about four years ago. At that point, my concept of a media center was having a tivo and being able to connect to the internet wireless. Fast forward 4 years and boy have things changed. I have always had an interest in gadgets but never considered myself a techie (not to be confused with trekkie, although I must admit I am one....) or "geek". 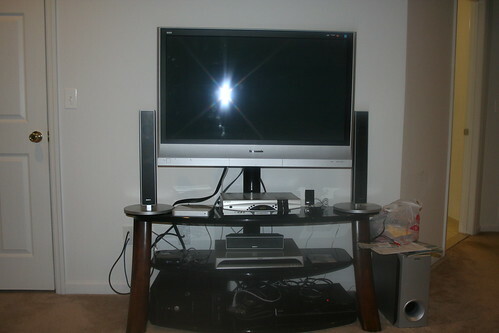 Then a few months ago I sat down and listed out my setup at home to see how far along I had come from my days of Tivo. That is when it hit me, I am a techie/geek, what I always considered a small hobby had become somewhat more, possibly even an obsession. I went from a tivo, a router, 1 network connection and 1 PC when we first bought our house to 2 PCs (1 of which is a touch screen), 2 HTPCs (self built), 4 gigabit switches, 4 network connections, a server, a networked receiver, and 8 extenders (of which 4 are also game consoles). I had created a home network where I now connect via wireless, wired Cat5e, and powerline. I was slinging my cable over the internet and was talking to relatives via WebCam. So what changed, how did I get from Point A to Point B. I can trace it back to when my wife and I had our first son 2 years ago. I decided to buy an AppleTV, my first extender, in hopes of streaming family photos/videos to my TV. I knew very little about file formats or codecs, and expected the moment I connected the AppleTV to my TV I would be up and running. Boy was I disappointed when I found out that the videos I had taken with my Sony Camcorder were not compatible with AppleTV. That is when I began doing research on video formats, different extenders, etc... and the rest is history! 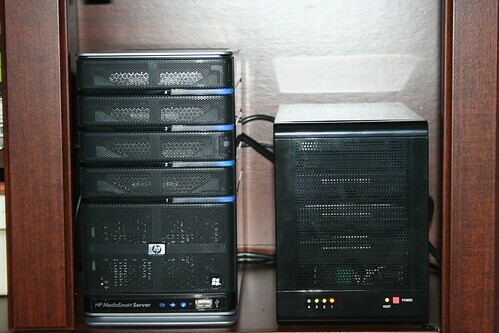 My goal originally started out as finding an extender that could handle all media and be user friendly. It has now morphed into creating the perfect (or as close to it as possible) whole house home media center. This will require having a network connection as well as some sort of media extender in every room, and a server to store and stream all my media. Utility Closet - this is in my basement where I have my cable modem and router (Linksys WRT610N). From here cat5e/6 wiring is connected to the router and runs throughout much of my house. Family Room - this would be the equivalent of the Home Theatre Room. 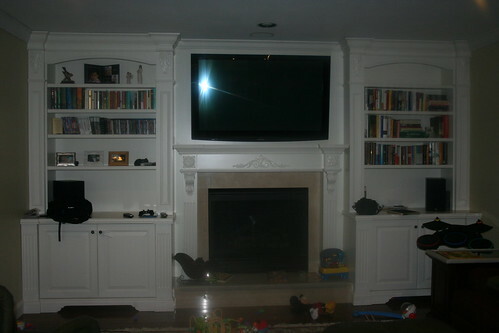 We had a built in wall unit placed along one wall where we have a fireplace. Right above the fireplace we had our tv hung, the Panasonic Viera TH-58PZ800U. 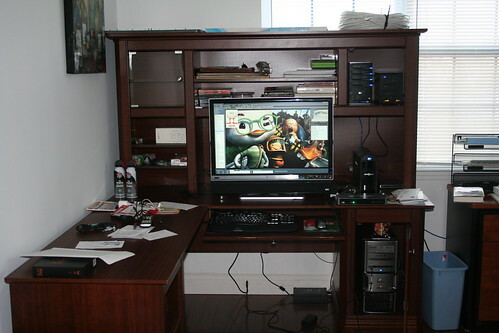 The bottom left (if facing) cabinet of the wall unit was designed to store my A/V equipment. In here I have my cable box, Xbox 360 w/ HD DVD player, HTPC (will comment on shortly), Onkyo TX-SR906 Receiver w/ Antec A/V cooler, PS3, D Link 8 Port Gigabit Switch (DGS-2208), and a Monster Cable Power Center. Since the goal is to keep the cabinet doors closed, I purchased the Harmony 890 remote with RF extender. I am also in the process of tackling heating issues due to the cabinet doors being closed (first step was getting the Antec cooler for my receiver). As much as this setup was meant for gaming and movie watching, it is currently dominated by Mickey Mouse Clubhouse and Dora the Explorer!! Playroom - really nothing special here, I just wanted to point out that I have a Popcornhour attached to the tv in this room. Although the interface on the PCH is pretty bad, I chose this for the playroom because I can install an internal HDD, put my son's movies on there, and keep unplugged from the network so I don't have to worry about him accessing inappropriate material. SageTV - I grew fond of this program very quickly after I started using. 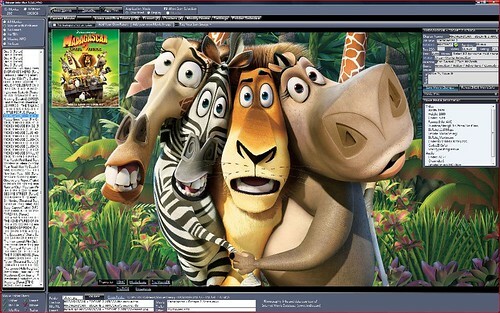 There is a high degree of customization and using the SageMC theme with the Movie Info Screen Plugin was a great addition (with the guidance of the Geektonic guides of course). SageTV has a large and very helpful community. Also, SageTV has done an excellent job integrating their HD200 extender. However, I have been experiencing issues with video playback on my x64 HTPCs (no issues on my x32 desktop) and have not had a chance to troubleshoot. 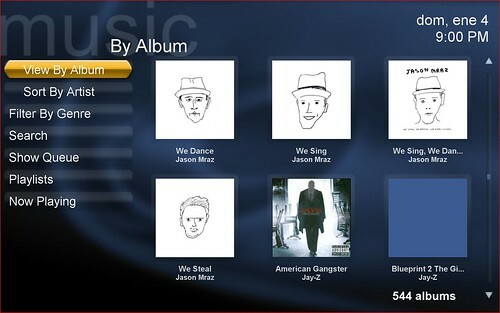 XBMC - if you want to go the extra step and really get the Wow factor, this is the program for you. I have a love/hate relationship with XBMC. They have a large active community, some very impressive skins/plugins (looking forward to the revamped Aeon skin due out end of March) and solid online content. On the downside there is no hardware acceleration for Windows and my MCE remote did not work out of the box (I know I could program the buttons using eventghost or something similar, but I was just hoping to get the basic functions working without having to do any programming). 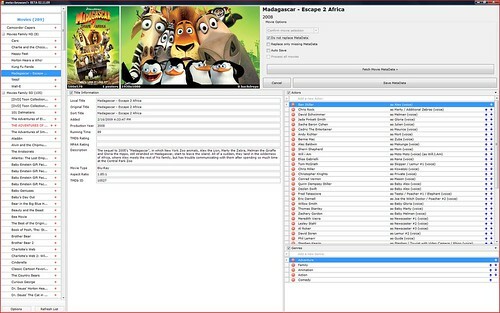 I have also been using a great program called Media Info Plus as my media scraper for XBMC. Now this was the shocker, I was cleaning up around the house last weekend, and in every corner there was a remote. 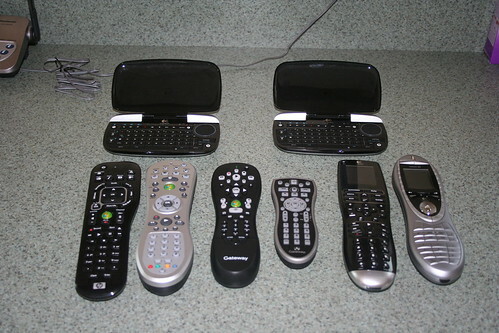 I gathered all my universal/media remotes and came up with 8, way more than I consciously had ever admitted I had!!! I have 2 diNovo Minis (I had a bad "d" button on the first, so Logitech sent me a second for free, now thats great customer service!). This really is a great HTPC remote since it combines the mouse/keyboard into a small form factor. Since I don't anticipate typing much on my HTPCs, the diNovo Mini fits perfectly into my setup and does not take up space. Aside from the 2 logitech remotes I have a combination of 4 MCE remotes. 2 of them came with my desktop PC and the other 2 I actually bought just so I could get the USB IR Receiver. So that is my setup. As you can see I have come a long way from having just a tivo, wireless router, and a tv! As for what the future holds, who know. I expect to see tighter integration of online content into devices, with cable/satellite providers getting into the mix. Wireless HDMI seems to be knocking on the door (although way too expensive IMHO). I also think that data management will take a bigger role in households, as families struggle with their growing digital library and how to store/secure. 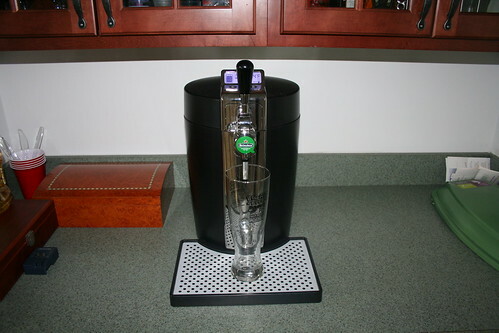 BUT, for now I have saved the best gadget for last, Cheers! About Damian: "Damian is a finance professional and tech enthusiast. He is married with 1 kid (and another on the way) and still plays baseball in the summer to help offset his geekiness." You can find more of Damian's musings on technology at his Digital Home Blog. Thanks goes out to Damian for sharing with us his new Home Theater PC Setup - be sure and ask any questions you have for Damian in the comments below. If you'd like to have your setup or media gadgets highlighted, and want a chance to win some Amazon.com gift certificates read the guidelines for submission here. We're looking for things as simple as a few photos of your favorite media-related gadgets or as elaborate as the Damian's setup outlined above, Dennis's home theater setup from last week and Sodarkangels HTPC build from earlier. Either way, join in on the GeekTonic flickr group and upload your media gadget photos! Deal of the Day: Linksys DMA 2200 Media Center Extender w/DVD $99! 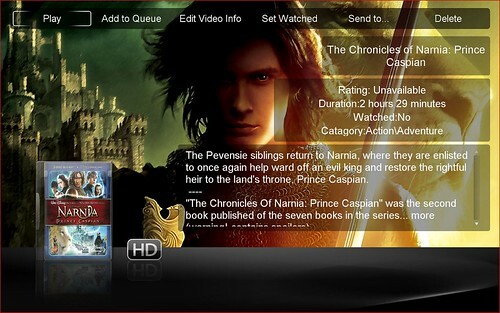 If you're a Windows Media Center user check out this deal! Dell has the LInksys DMA 2200 Media Extender (the one with a built in DVD Drive) for $99.99 ($100 OFF!!!) A great deal indeed. 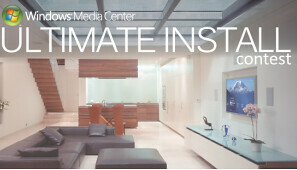 Microsoft is running their third Ultimate Install Contest, an "industry design contest" that promotes Windows Media Center's use in custom home install projects. The contest is definitely focused towards professional custom installers, but I keep an eye on the contest as it provides insight into some great implementations of Home Theater PC projects. I probably don't need to say this to you - knowing you're all pretty savvy about these sort of things. Still I thought it might be worth mentioning in case the new iPod Shuffle story was too small to have been noticed by you. Don't under any circumstances purchase the new iPod Shuffle. Apple's new iPod shuffle requires a specially equipped Apple headphone since the controls for the darn thing are ON THE headphone cord. To make matters worse, it's being reported that any third party headphones will require an Apple-licensed authentication chip for it to work. Sorry, but this is craziness on Apples' part and they have just gone too far with this one. An already overpriced, under-featured iPod now requires an overly expensive headphone or a crappy Apple headphone for it to work. I own several Apple devices including an iPod Touch, an iPod Classic and an iPod Nano but if this sort of craziness continues I'll be switching to the competition in a heartbeat. I always enjoy the EngadgetHD podcast each week with Ben Drawbaugh and Steve Kim. They focus on all things HD, but because of Ben's time with Windows Media Center there always tends to be a little HTPC talk as well. This week, Ben ran a special pocast Engadget HD Podcast (two this week) focused on Windows Media Center and it's place with enthusiasts and custom integrators. Ben interviewed Derek Flickinger who happens to be the host of the new podcast The Custom Integrator Show on Ian Dixon's Digital Media network. Ben and Derek cover Windows Media Center, HDMI and the Media Center Integrator Alliance. If you have any interest in Windows Media Center and are curious at all about the custom integrators and how they fit in with enthusiasts like you and me, give this one a listen. For all of the HD sports I consume over the year, one of my very favorite sporting events is the NCAA Basketball Tournament. Even if you don't have a favorite team in the tournament this year, you can follow along by making your picks for the bracket. To help you along in that process, I've updated the excel spreadsheet I use each year (suitable for any Basketball Geek) that lets you select your picks from a drop-down and easily print & save your picks. It's free, easy and will soon be pre-filled with all of the teams in the 2009 NCAA Tournament bracket. Get your download of the Excel March Madness 2009 Bracket here. The Boxee team created an iPhone app for Boxee quiet a while back and it's been available for jailbroken phones for a while now. It took a while to get through that mysterious Apple approval process, but the iPhone/iPod Touch Remote app for Boxee is finally available in the official Apple iTunes Store as of Sunday evening. The Boxee remote for the iPhone (and iPod Touch) doesn't stream to your iPhone, but it does turn your iPhone into a boxee remote control. The free application connects to Boxee via WiFi with two modes: Gesture Mode and Buttons Mode. 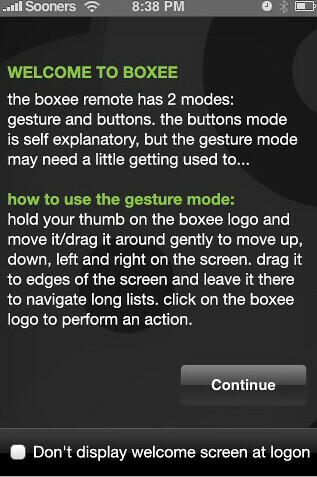 In Gesture Mode you hold your thumb down and drag the boxee logo around to move up/down/right/left. Drag it to the edge of the screen & hold to navigate long lists. Click on teh boxee logo to execute an action - like an enter button. 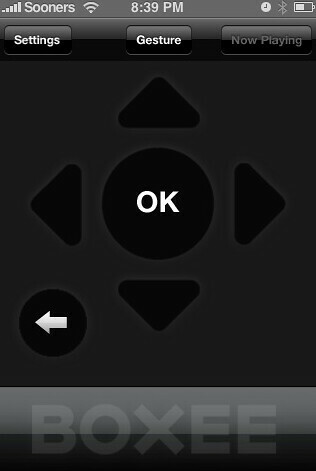 In Buttons mode, you use the traditional buttons on the screen to control your Boxee Media Center functions. It's simple, but it works. Whenever prompted to enter text in boxee, you can also use the iPhone keyboard to enter the text. The settings page on the app is pretty basic. 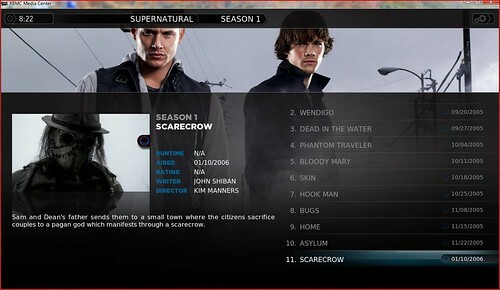 From the settings page you can adjust settings and manage "hosts"
Week 11 of the Winter (almost Spring) 2009 TV Season has arrived. Only a couple of returning and premiering shows for this week. Read on for all of the details. 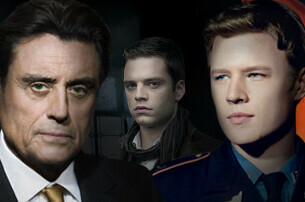 Kings (8pm on NBC - available in HD) Kings is a heavily promoted contemporary soap premiering on NBC tonight. Inspired by the biblical story of King David, the storyline follows a small town guy who becomse involved with high society and politics and rises to the top against odds. Better Off Ted (8:30pm on ABC) - Series Premiere of a new sitcom for ABC. This one puts Ted Crisp who loves his job at a company that isn't all that ethical, but Ted is. I haven't heard much about this one, but will be recording it in case it is decent. The NCAA March Madness Basketball Tournament Begins!